Clear Translucent 5-1/2" x 5-1/2" Square envelopes are perfect for announcements, special events, RSVPs, corporate dinners, weddings, greeting cards, holiday cards, invitations, direct mail or general use.With a sleek square flap, square envelopes are designed to compliment your stylish invitations, tasteful thank you cards or meaningful notes.Made from high-quality, durable 30lb. paper. 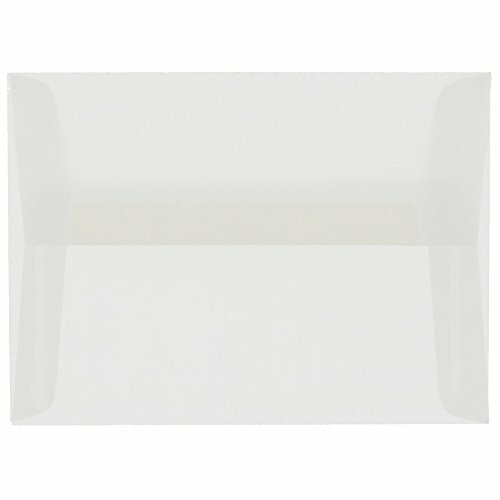 Features a modern square flap, easily sealed by a Peel & Press Strip. No need to seal with an envelope moistener or tongue, just Peel...and Press. Constructed with a side seam design on the back of the envelope.Printable on off-set and digital printing presses and some home printers. 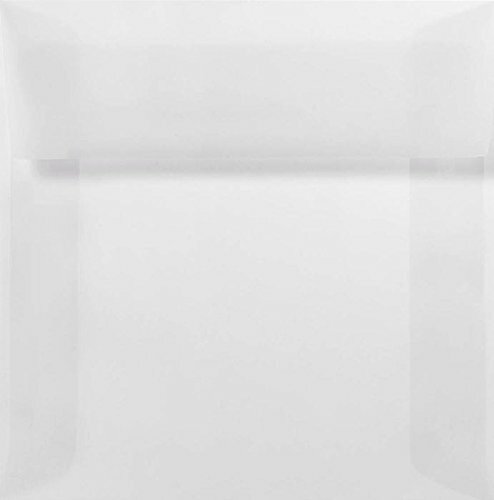 If you're looking for the perfect invitation envelope for any event or business use, 5 1/2 x 5 1/2 Square Envelopes in Clear Translucent are the perfect choice and an amazing value. Click the yellow "Add to Cart" button now! 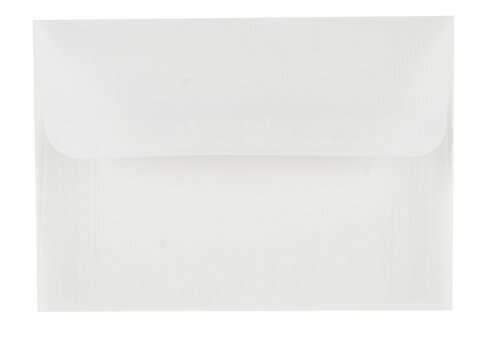 JAM Paper Translucent Envelopes are available in a wide variety of colors and sizes! When sending important mail, Translucent Envelopes give you the chance to express your creative side. Because you get to pick from tons of distinctive colors and sizes in order to create the perfect invitation or letter. Choose from a range of pretty lights, vibrant brights, and neutrals too. For any creative project, you can find the exact color you're dreaming of. So you get just what you want, instead of settling for something close. Translucent Envelopes have a unique see-through characteristic. Rather than sending a single-color envelope, you can design a nice contrasting palette. Simply pair your invitation with a complimenting color envelope. Since the inside contents are visible from the outside, your recipients will marvel at your artistic invitation design. 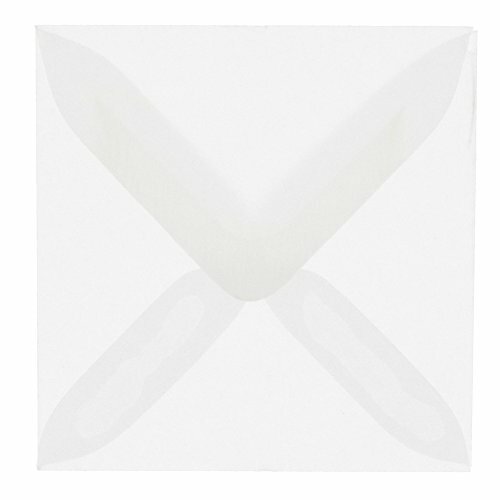 JAM Paper Translucent Vellum Envelopes are square 3 1/8 x 3 1/8" envelopes. 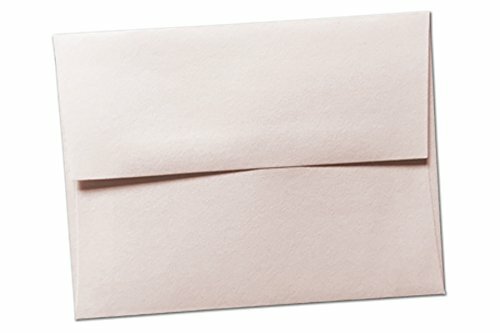 Made of 30 lb paper with a vellum finish, these envelopes are more stylish than an average paper envelope. The booklet opening includes a V-flap with a gum adhesive for an easy and clean seal. 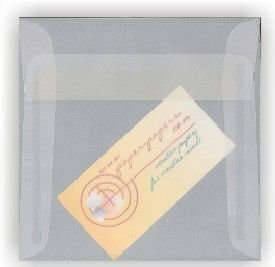 The translucent envelopes offer an exciting sneak peek at its contents, whether it is a party invitation or a greeting card. This pack of 100 is perfect for any and all occasions in which an exciting envelope is needed! These are the perfect sized envelopes for holiday cards, greeting cards, invitations, photos, announcements, direct mail, and more! They are perfect for holidays, weddings, baby showers, birthdays and banquets. Make sure to always have some square envelopes on hand when you need them! Each envelope measures 5.5 x 5.5 inches. NOTE: These envelopes can NOT be mailed via the United States Postal Service (USPS). 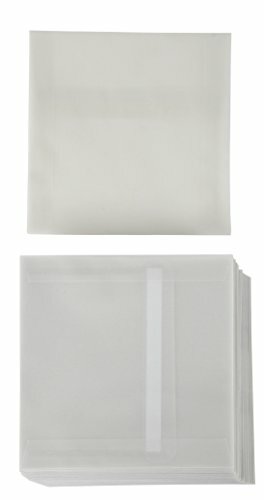 These are the perfect sized envelopes for holiday cards, greeting cards, invitations, photos, announcements, direct mail, and more! They are perfect for holidays, weddings, baby showers, birthdays and banquets. Make sure to always have some square envelopes on hand when you need them! Each envelope measures 3.6 x 5.1 inches. NOTE: These envelopes can NOT be mailed via the United States Postal Service (USPS). These are the perfect A7 size envelopes for holiday cards, greeting cards, invitations, photos, announcements, direct mail, and more! They are perfect for holidays, weddings, baby showers, birthdays and banquets. Make sure to always have some square envelopes on hand when you need them! Each envelope measures 5.25 x 7.25 inches. NOTE: These envelopes can NOT be mailed via the United States Postal Service (USPS). Basis A7 invitation envelopes bring a special added touch to your DIY wedding invitations, graduation announcements, and special celebrations. These soft, matte finish envelopes come in a bountiful array of bold, bright, and basic colors. They can also be used for bulk mailings where a high quality 70lb. text weight envelope is the key to a well pleased customer. Labels or special writing tools may be necessary when addressing the dark colored envelopes. 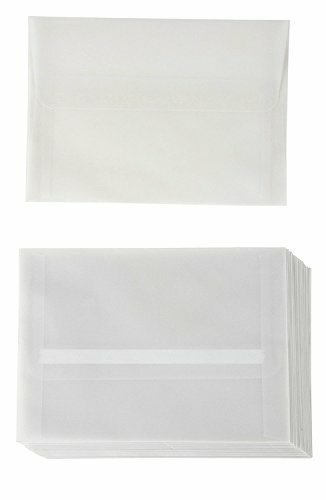 Looking for more Square Vellum Envelopes similar ideas? Try to explore these searches: Cycling Shoes Cleats, Aluminum Tongs, and Cilantro Lime Shrimp. Look at latest related video about Square Vellum Envelopes. Shopwizion.com is the smartest way for online shopping: compare prices of leading online shops for best deals around the web. 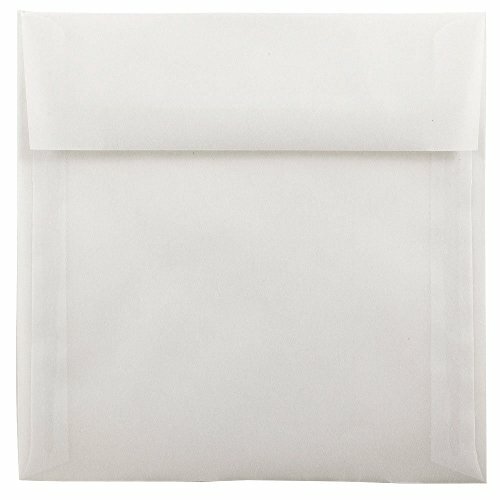 Don't miss TOP Square Vellum Envelopes deals, updated daily.